Xenical Review (UPDATED 2019): Don't Buy Before You Read This! The prescription-strength pill is not for the casual dieter. Xenical is a weight loss diet pill made to help reduce the intake of dietary fats. It’s a prescription drug available only via the recommendation of a doctor. Clinical studies have been run which show it has weight loss effects. A diet and exercise plan is required in order to see results, and this drug is intended only for short term use. A certain amount of calories from dietary fats are not absorbed, instead they are passed through bowel movements. In this comprehensive review you’ll learn about how effective it is, customer listed side effects, what kind of weight loss it can produce, and much more. A list of the top 10 diet pill supplements is available when you click here. Orlistat (also named Tetrahydrolipstatin): This ingredient is sold as either an over the counter or in the case of Xenical, only via prescription. It is intended to be taken alongside a low calorie diet, and only for people with a BMI of 30 or higher, or 27 or higher if one has an obesity related illness. Reduction of fat soluble vitamins which may cause nutritional deficiencies. Increased bowel movements, oily stools, and watery stools. Liver damage, kidney stones and allergic reactions. Difficulty breathing, dizziness, and itching. Yellowing of the skin and eyes, dark urine, and back pain. Frequent and painful urination, pain in the stomach, and bathroom issues. Certain symptoms may be a sign of a bigger issue, and it’s advised to seek immediate medical attention if one experiences side effects such as odd colored urine, seizures, and many other issues. There’s no way to determine what one might experience, as even healthy people can suffer from unwanted side effects. It’s necessary to reduce fats to around 30% of one’s total macronutrient amount. Increased fats may produce several unwanted side effects. So although this ingredient is meant to reduce some of the calories from fats, one still has to be careful of their fat intake. Due to it being able to reduce fat soluble vitamins, it may produce other long term health damaging effects. It may require an additional use of multivitamins to make up for the loss. The kinds of vitamins which are fat soluble include vitamins A, D, E, and K.
2.9 kg is roughly 6 pounds; over a year this means it produced around 0.5 pounds of weight loss a month. This is extremely low considering all the potential side effects, as well as the necessary diet and exercise plan. It’s unknown if the weight loss benefits are due to the added diet and exercise which are required. Certain people are advised to never use this ingredient, as it may increase the risk for serious side effects. Those with difficulty processing nutrients, eating disorders, history of seizures, digestive problems, and other issues are advised not to use this. It can potentially cause serious health concerns. A doctor also has to ensure one is healthy enough while being obese enough to benefit from Orlistat. One sole ingredient is offered which is intended to help reduce some dietary fats. It has no other weight loss use, and can only reduce a fraction of the calories from fats. This means for people who don’t eat much fat micronutrients, it won’t have much of an effect. Though one still has to limit the amount of calories they eat that come from fats. There also has to be a complete lifestyle change, requiring diet and exercise. A doctor can only prescribe this drug, and it needs to be taken with careful watch over any side effects. Certain people have experienced serious side effects from Xenical. It’s also advised to avoid this if one has certain medical conditions. Xenical has been tested in clinical studies, with the leading study showing that it has limited weight loss potential. It also had an increased risk for side effects such as gastrointestinal problems. To see which diet pill supplements were ranked as the top 10, click here. Pricing for Xenical depends on where it is purchased from. A standard pricing for places like Walgreens and CVS goes for $172.42 per 30 capsule bottle. Since it’s recommended to take 3 a day, each bottle lasts 10 days. This makes the daily price for use is $17.24. No money back return is offered and there’s no guarantee of safety. There are numerous possible side effects and certain people may be more susceptible to symptoms. As you’ll see in the “Customer Opinions” of Xenical” section, there were many issues with side effects and a lack of weight loss benefits. The sole ingredient in Xenical has only been shown to be modestly effective at weight loss. One study showed it only promoted around 0.5 pounds of weight loss per month. Some users failed to see any benefit. There also has to be a complete diet and exercise plan used, which may be a big reason for any weight loss experienced. Still, because there is no guarantee, it’s unknown what kind of an effect this diet pill may have. It requires a lot of careful consideration, and a doctor can only prescribe it if he deems a person is healthy enough. A list of the top 10 diet pill supplements is featured in this link. They have had to settle major lawsuit, of which was due to patent infringement costing $200 million. The company was also shown to have written speeches for politicians who were paid off by them. A $67 million dollar lawsuit was also settled over false drug claims. The company was found to have lied about the effectiveness of one of their drugs. People were often disappointed to find that they experienced side effects, with a lack of weight loss benefits. This includes people who made sure to exercise more and eat fewer calories. People who tracked their calories carefully and added more exercise also failed to see any benefit. Side effects were a concern as people mentioned they experienced nausea, oily discharge, increased bathroom usage, oily stools, diarrhea, stomach problems, stomach pain, and many other symptoms. Certain people had to stop taking this drug because of the heavy stomach related side effects. Some users were unable to do basic tasks, as they had to constantly use the bathroom. A common symptom was bathroom related issues, with certain people unable to control their bowel movements. There were also people who were forced to the hospital due to symptoms. Conclusion - Does Xenical Work? When making a decision on Xenical it’s important to examine the customer reviews, what kinds of effects are possible, and what clinical studies have to say about it. Many customers failed to see any benefit, but there were many complaints about serious side effects. Exercise and calorie counting is also necessary, with a reduction of fats. Still, no guarantee is offered, and the only intended benefit is to reduce the calories from fats. No other weight loss benefit is possible from Xenical. A major clinical study also showed that it could only reduce 6 pounds in a total of one year. The 2019 top ranking supplement of the year goes by the name of Sletrokor. It has only plant based extracts with no added binders, fillers, preservatives, stimulants, or unnecessary additives. Customers have left many great reviews and testimonials to showcase its potent weight loss. Its effects include appetite suppression, increased metabolism, fat burning, improved mood, and many other benefits. Users of Sletrokor have commented that it’s easy to take, and that it helped produce potent weight loss. I had on it for three years now. I was 5"3' and 140 pounds . Now I'm still 5"3' ( lol ) but I weigh 110. I could not be happier with this pill. It does discourage you from eating fats due to truly alarming side effects and it helps you to make great nutritional choices . I eat pizza , yes , but once a month , I hardly have fries or burgers full of mayo, I never eat fatty foods in public and I still have milk in my tea with no adverse effects. When I first started I had the entire nine yards of alarming events, if you catch my drift . This petered off at the 6 month mark . Then as the weight started to come off I trained myself in what not to consume. Now I eat what I like but in moderation , I exercise a tiny bit ( 60-100 lunges every other day ) and I eat ice cream and when I like , but only if I am home until the next day. Where can I buy Xenical? Can't find it anywhere! Why I am using Xenical and not losing weight? I have taken 24 pills already and no changes have been seen. I am taking two pills directly after the one meal a day I eat. I weigh 65 kgs and my height 160. After being on XENICAL for 5 weeks i have lost 2 stone, to a diet as i have weight watchers sheets, if you eat fat it will upset you, i have only had one bad trip to the loo my own fault eating too much fatty pork !! Lately suffering with bad indidgeston never had this but assuming it may be onions still overall its helping and working happy with the tablets . This has been amazing. The bowel movements have sucked but in a month and a half I've lost over 10lbs I do expertise but it really makes u realize what u r eating. If u eat something high in fat, your bowels r not bowel, but just the fat. Thirty side effects are just a reminder what u are putting in your body. It's been awesome. I'm at 179 and am only 9lbs away from finally being able to get a breast reduction. Keep with it, it works! i takeoristat for 4 days.is it normal having an Uti while i take this drug? do i need to stop this drugs because i Got the side effect? pls help me. I have been on them for four days,been sticking to the low fat diet so its going well.I have bad piles and the loser stolls and regular bathroom visits help me.And as for not wanting to see fat residue in the toilet id rather see it there than on my body wobbling around every day. I HAVE BEEN ON XENICAL FOR 9 MONTHS AND LOST 4 STONE . I KEEP TO 12 TO 15 SATURATED FAT PER DAY. AND ABOUT 1500 CALORIES SO WHATCH YOUR SATURATED FATS. DO ABIT OF WALKING OR EXCERSE. HOPE THIS BLOG WILL HELP OTHER PEOPLE ON XENICAL (PERSCRIBED BY DOCTOR ON PERSCIPTION). i took the xenical over nearly 6 months ,i lost 24 kg but i did keep an eye what I ate.i didnt eat fat food and i didnt do any eercise.i did try myself from time to time for chineese and indian but paid next day in toilet . i put more less 4 kg over christmas i m going to take them again only to lose 4 kg .om really happy what the xencal did to me ! I lost 51kg in 2 weeks time. Xenical is marvellous slimming pills and i luv it. I still need to put off weight as much as possible due to i am obesity. I took Xenical when I was 17/18 years of age, my mother was want it and had stop taking them. At first I didnt like the side effects, it felt as thought I had gas, but I didnt. I ate way to much fatty foods. I was really close to a size 22, but by the time I was 19 I was at a 16 almost 14. I love what it did for me! Now, I'm 27 I'm going through the same thing, and looking to start taking them again. It also helps me not want to eat as much. I only take one pill a day, but it suggest you take them 3 times a day. In the past it took some time to get into my system, but since I started it again it's taking affect right away! But, I know everyone is different, try it for yourself, and talk to your Doctor first. There are many diet pills on the market claiming that their "secret," "proven," "patent-pending" formula is the weight loss answer you've been looking for. But few come with an FDA approval nor a prescription-strength formula like Xenical (also known as Orlistat). Xenical is prescribed to obese individuals only by their physician and after determining their body mass index (BMI) is 30 or higher (27 if you have other risks like blood pressure or diabetes). Xenical is responsible for helping many overweight individuals finally find success and maintain. Xenical is usually not considered a first choice. Your physician will want to know if you've already tried diets, exercise and other weight loss means, but yet to find success. 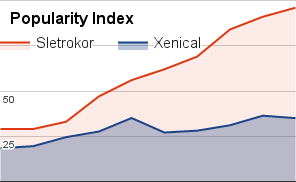 So how exactly does Xenical work so succesfully? Xenical works directly in your digestive system and is responsible for keeping 1/3 of the fat you ingest from being absorbed. This is why Xenical calls for a serious reduction in the amount of fat you consume. Orlistat is the main ingredient in Xencial. A complete list of ingredients for Xenical is not available. Because this is a prescription only product, your doctor would be able to share the ingredients with you before prescribing. Your doctor would be able to explain dosage and how many tablets to take daily. This information is not available without having a prescription. While taking Xenical, you'll follow a low-fat diet (no more than 30% of your calories) that is identical to the diet outlined by the American Heart Association. Xenical is a 120 mg capsule and is only available by prescription. It is to be taken with meals that contain fat, no more than three times daily. Xenical also encourages taking a multi-vitamin each day. Xenical is not for everyone. Since it's made for prescription, it's given to those who are most in need.